SeaPerch competition challenges student teamwork, knowledge. Throughout the United States, thousands of students are gathering to build, maneuver, tweak and perfect their ability in something not well known: underwater robotics. On Saturday, March 24, one such meeting took place in DeKalb County School District (DCSD). Schools from throughout DCSD and beyond united at Chamblee Charter High School for a regional SeaPerch competition. The event tested students’ STEM knowledge, problem-solving skills, communication, hand-eye coordination, and teamwork from 9 a.m. until 4 p.m.
SeaPerch is an underwater robotics program that tasks students with building and operating an underwater remotely operated vehicle (ROV). SeaPerch competitions are arenas where teams can measure who has the best ROV, ROV operator, navigator, and overall team through underwater obstacle courses. DCSD partnered with Navy City Outreach Southeast, Spelman University and school districts from as far away as Alabama to provide such an arena to students, according to DCSD STEM/STEAM coordinator Andrea Wright. “Kids practice at their local YMCA, pools at their school, and inflatable pools—whatever they can get their hands on in their community. They have to get kind of creative with it,” Wright said. Teams are also required to submit an engineering notebook detailing the ROV’s development process, incorporating students’ skills in science, technology, engineering and mathematics (STEM). Students often have to repair, modify and add to their devices on the fly using trial and error. 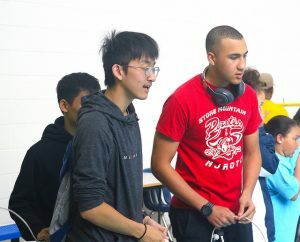 Southwest DeKalb High’s JROTC team, made up of sophomore Ashlin Culpepper, sophomore Jalen Miner, and senior Saje Capers, showcased their talents at SeaPerch for the first time at Chamblee Charter. Their ROV navigator, Culpepper, obtained a score of 7 on his first-ever attempt. Capers said he enjoyed creating something from the ground up and seeing it work efficiently. He also said he enjoyed learning how to solder, measure correctly and use certain tools. All three team members said they are now considering careers in engineering after having such exposure. Stone Mountain High School’s SeaPerch team also participated, assembling JROTC cadets sophomore Malachi Kulon, junior Micah Ash, sophomore Trevon Ellis, sophomore Lah Paung and freshman Alex Nguyen. Nguyen, who served as the team’s ROV operator, said the Stone Mountain’s device had more nuanced maneuverability because it was built from scratch rather than a scale model. “It’s original. We had to do a lot of calculations to figure it out completely,” he said. Peachtree Charter Middle School was represented by three teams: one made up of all-female sixth-graders, one of just two seventh-graders and one of two eighth graders. 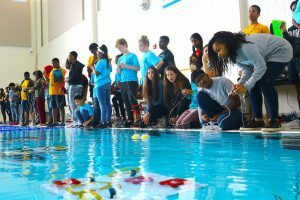 Peachtree Charter eighth graders and first-year SeaPerch competitors Manas Gangwar and Tahirah Abdullah have different reasons for liking the competition, but share an appreciation for teamwork. “For me, it’s this, the competing part—how the wiring works, how you’re going to deal with it, how you’re going to maneuver around each obstacle,” Gangwar said. “Doing this by yourself would be ten times more difficult. STEM Coordinator and Peachtree Charter coach Tim Ryan said SeaPerch allows students to apply STEM skills in an immediate, observable way. Ryan said SeaPerch provides a platform for students to work together as a team toward a common goal—but also takes that dynamic a step forward by having these teams judged by professionals. “You see the excitement they have, and that’s the reward,” Ryan said. Click here for more information on the SeaPerch competition. Click here to view pictures from the SeaPerch competition.